Here at SGS Engineering, we understand that finding high quality pneumatic products at the right price can be difficult. That’s why we made it our mission to manufacture a range of pneumatic products that suit your budget perfectly. Our air tool kits are no different, so if you’re looking for an air tool kit that has been made with knowledge and a genuine passion for the industry, then you’re in the right place. Browse the range today. Whether you’re looking for something really comprehensive, or you’re in need of something specific, then you’ve come to the right place. 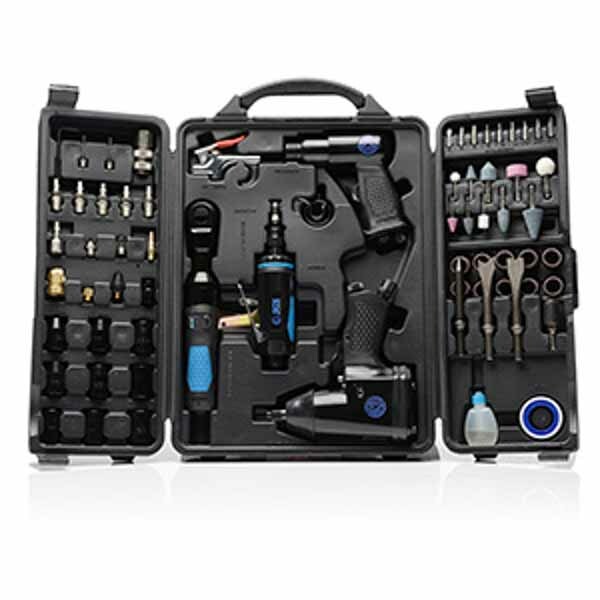 We have a range of different types of air tool kits so you’re prepared for every job. From kits with 70+ pieces included to more minimal wrench kits with a very specific use, we sure to have what you’re looking for. We pride ourselves on our knowledge and experience in hydraulics and pneumatics industries, so if you have any questions, then please don’t hesitate to get in contact. A member of our friendly team will be more than happy to help, whether it’s an in depth answer you’re looking for, or just some simple, honest advice. Give us a call on 01332 576 850. So if you’re in need of a new air tool kit, then don’t delay any longer. Order yours with SGS today.